The Walking Dead: Road to Survival is an RPG strategy game ripped from the comic book pages of the hit graphic novel & television series. 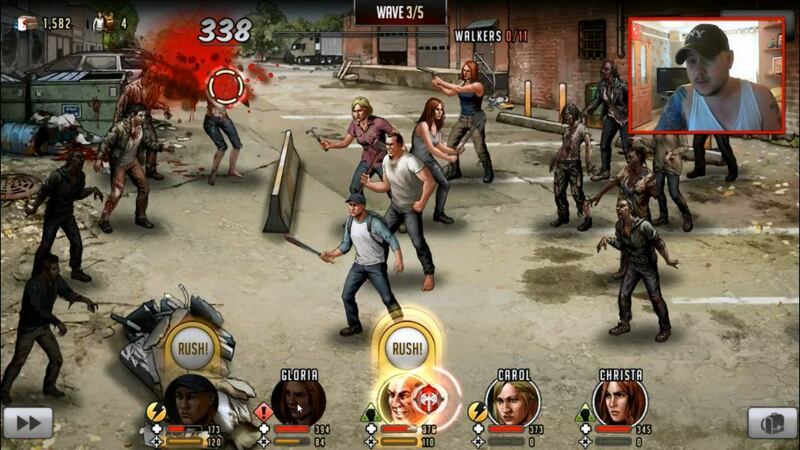 Build a team of post-apocalyptic survivors facing waves of undead zombie walkers and even human foes. In this The Walking Dead: Road to Survival game guide video for PC you will learn of strategies implored by one of our avid gamers in our Community whose screen name is RevanTheLegend. You can appreciate the details on the larger screen when playing The Walking Dead: Road to Survival on PC via BlueStacks. We scroll around and see the compound; buildings, protection, resources and even some hungry feasting zombies. The artwork have the graphic novel look and feel- which look amazing on the larger screen. In Road to Survival, battles are turn-based- meaning you execute all your strikes from each character on your team then your opponent is allowed the same (granted dealing significantly less as you take them out first). Just as the game subtitle suggests your goal is to survive waves of attacks using tactical advantages from your team members. Each character has a ‘Regular’ attack in addition to a ‘Rush’ more powerful attack. It’s important to understand each team member attacks and when it’s best to use them. In the final wave you meet a boss. With boss battles, you will want to focus on them as they’re more powerful. At the end of waves you are judged in a three star plus items collected manner. Another hiccup to watch for in bouts are obstacles. If an enemy is behind an obstacle and you do not have a weapon like a gun you cannot attack directly. For example, in the video we could not attack the zombie behind the K-rail without a gun. We could either use a pistol and give her a head-shot or allow her to move closer to attack. If zombies are faded in the shadowy distance you cannot effectively attack as well. Unfortunately you must wait until they draw closer else risk your strike being blocked. Rushes are great. Understand each team members rush and when to use them. Hopefully this guide and video demonstrates how to get started attacking with The Walking Dead: Road to Survival. Stay tuned for more game guides of this series.